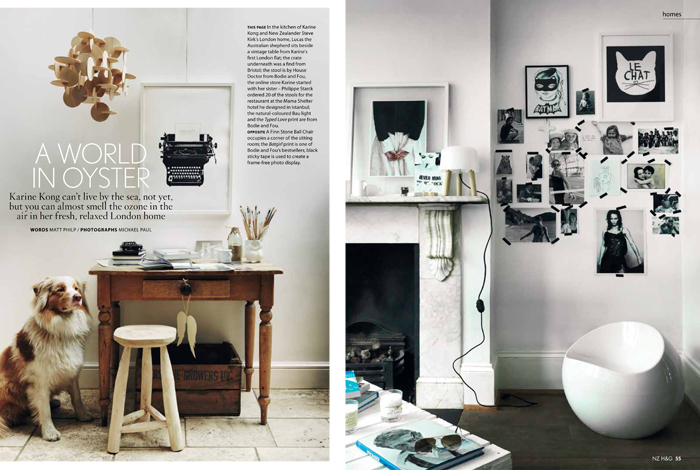 Our London home is being featured in the July issue of NZ House & Garden! I love it when we are in an Australian or New-Zealander magazine. We have so many friends and family over there, it makes the feature a bit more special. Les photos de notre maison londonnienne sont parus dans l’édition de Juillet de NZ House & Garden! J’adore quand nous avons un article dans un magazine Australien ou Néo-Zélandais. Nous avons tellement d’amis et de famille la-bas, que cela rend l’article un peu plus spécial. Your home looks beautiful but homely & lived in too. Is the type writer print one from your store & if so will it be available again?? So in love with this ball chair! Your home is very beautiful. I was wondering how u manage to keep all the white in your house so pristine looking? I mean obviously for a shoot you made it look the best but doesn´t all the white make cleaning difficult? Well…all the white have been painted with waterproof paint so when they get scuff marks, they are easy to clean up and the linen cover on our sofa is removable and washable.